Even though January was on the dry side, the two graphs above show how much improvement was made to precipitation and SWE totals between February 1 and February 5. The watershed received 90% of its monthly total precipitation in the first 5 days of the month, moving water-year precipitation up to 96% of average and total SWE accumulation up to 91% of average. As of February 6, forecasts call for below-average temperatures and above-average precipitation for the next two weeks. Overall February is expected to be cold and wet. At this point, it won’t take much more precipitation for February to end up above average. Island Park Reservoir stayed constant throughout the month at 88-89% full, the same place it has been since the beginning of December. Outflow from the reservoir has been in the range of 500-560 cfs all winter, with an average of around 520 cfs. For reference, last winter’s average outflow was 504 cfs. In order to keep the reservoir from getting too full while ice-covered, outflow has been a little higher even than the river’s natural flow, as recent precipitation has added substantially to total reservoir inflow. Essentially, with the reservoir already at its desired April-1 contents, the extra water added by direct precipitation has contributed to outflow. Buffalo River flow has been close to average all winter, and the result has been flow through Box Canyon that is equal to the river’s natural flow–what would be in the river in absence of Henry’s Lake and Island Park dams. With almost 8 weeks still remaining in the snow accumulation season, the range of possible peak SWE values is pretty large. Worst-case scenario is that we get no more precipitation the rest of the winter and end up at 60% of average SWE. This would put the 2019 snowpack close to the minimum experienced over the last 30 years. Of course, that won’t happen, given that moderate precipitation is forecast with high confidence 3-5 days from now. Based on long-term outlooks, there is a pretty good chance of receiving average precipitation for the rest of the winter, which would result in peak SWE of about 93%. We would need 120% of average precipitation over the next 8 weeks to reach average in early April. Although well within the range of possibilities, 120% of average precipitation for the rest of the winter is not likely. At this point, I predict that peak SWE will end up around 90% of average, which is pretty good considering that SWE was below 70% of average in early January. When and where this year’s snowpack contributes to streamflow depends on how it is distributed across the watershed and how fast it melts. Right now, the upper Henry’s Fork and Teton subwatersheds seem likely to end up with SWE near average, but peak SWE in Fall River will almost certainly be below average. 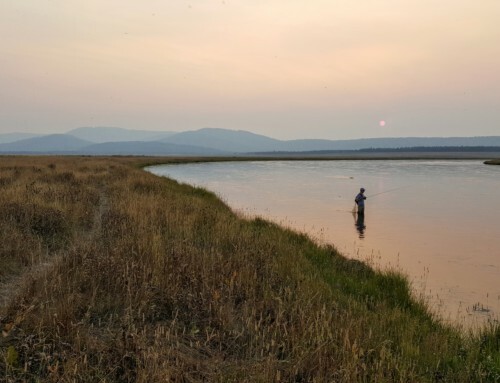 Based on these predictions and on current baseflows (amount of water in streams during the late winter, when groundwater is the primary source), summertime streamflow is likely to be around average in the upper Henry’s Fork and Teton River and around 85% of average in Fall River. Depending on spring and early summer rain, these conditions would suggest summertime streamflow in Fall River that is only about 80-90% of its 2018 value and delivery of storage from Island Park Reservoir that is a little higher than it was in 2018. However, I do not anticipate extended periods of outflow from Island Park Reservoir any higher than around 1,300 cfs. Regardless of what the weather is like between now and irrigation season, two things are certain at this point. First, because Island Park Reservoir is so close to full, outflow from the reservoir during periods of snowmelt and rain-fed runoff this spring will be roughly the same as inflow, resulting in natural springtime freshet flows in the river downstream of the dam. If rain events are heavy, like they were in 2018, some of these runoff flows could be pretty high–1,600 cfs or greater–and could result in rapid flow changes in response to changes in the weather. The second thing that is certain right now is that trout recruitment in the river downstream of Island Park Dam will be very good this year and next year, due to well above-average winter flow both last year and this year. 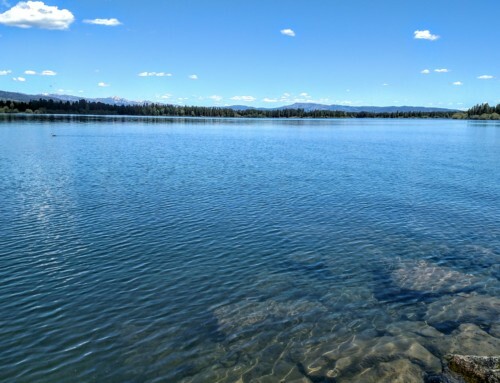 Whether we get a third consecutive year of high winter flows will depend on the 2019 snowpack, spring and summer rain, and how much more water can be saved in Island Park Reservoir as HFF and its partners continue to expand irrigation demand-reduction and precision water management programs.